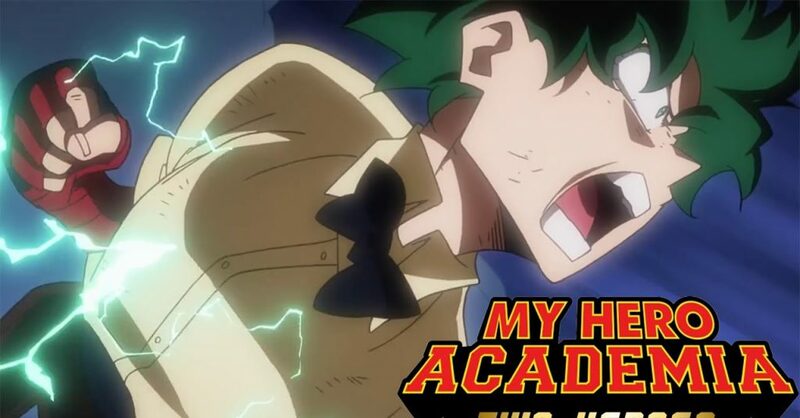 My Hero Academia: Two Heroes Review | An Awesome Treat for BNHA fans! Hurry, it's still screening in select cinemas in the PH! It’s safe to say that My Hero Academia (Boku no Hero Academia/BNHA) is one of today’s most popular shonen anime/mange series; so much so that the series was even used to promote Avengers: Infinity War in Japan. And as with most popular shonen series (think Naruto or Bleach), BNHA just got its first movie earlier this year — My Hero Academia: Two Heroes. As a fan of BNHA, I couldn’t wait to see the movie! Though of course I had some reservations as the movie is set between Seasons 2 and 3, meaning it probably won’t top the first arc of S3 in terms of pure hype (ep. 49 specifically). Two Heroes is also a standalone movie, which I feared will make the film’s plot a bit unnecessary or have a lack of importance to the overall series storyline. Reservations aside, I still watched the movie in theaters last October 31; I mean, who would say no to My Hero Academia on the big screen? So is it worth a watch in the cinema? Yes, very much so! 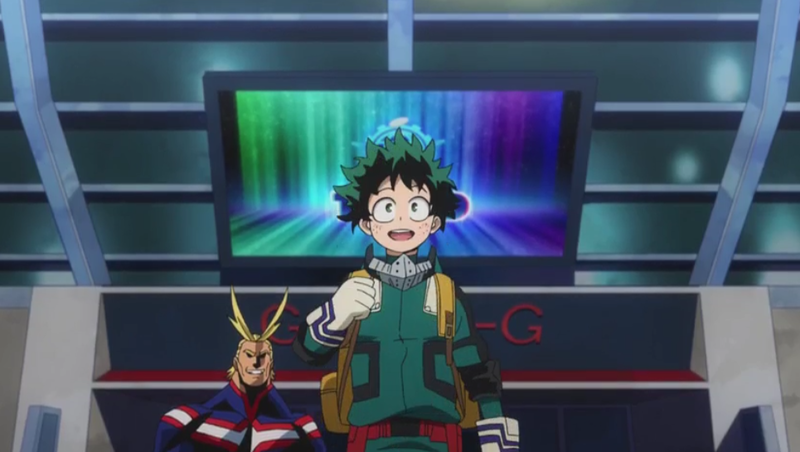 Two Heroes follows Izuku ‘Deku‘ Midoriya and All Might as they travel to I-Island for I-Expo, the world’s leading exhibition of quirks and hero item innovations. The pair was invited by Melissa Shield, an aspiring scientist and the daughter of David Shield — All Might’s former partner back in his days in the US. What was supposed to be a fun trip quickly takes a turn for the worse as villains manage to hijack I-Island’s security system on the first day of I-Expo. It is then up to Deku and his fellow heroes-in-training of Class 1-A (who are conveniently also at I-Island) to save the day. Two Heroes tells a solid tale that should be right up the alley of any BNHA fan. Sure, the movie’s plot may not serve up anything groundbreaking, but the story is definitely engaging. It also helps that the two new characters (David and Melissa Sheild) have interesting backstories and personalities. Speaking of backstories, the movie opens with a flashback from All Might and David’s time studying in the USA. 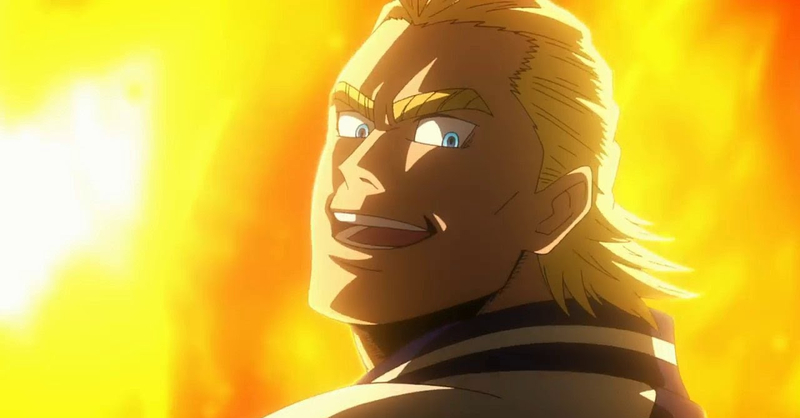 While the film’s opening scene wasn’t that long, it was well executed; the flashback not only introduced All Might and David Shield’s relationship, it also strengthened All Might’s persona as the Symbol of Peace. David’s daughter Melissa is also given some time to shine during the film’s opening act. Melissa gets some time to spend with Deku and a couple of his classmates in Class 1-A as she tours them around I-Expo. During her tour, Melissa’s strength of character (despite of lack of quirk) and motivations was presented quite well, not to mention that she fit it nicely with the Class 1-A members. 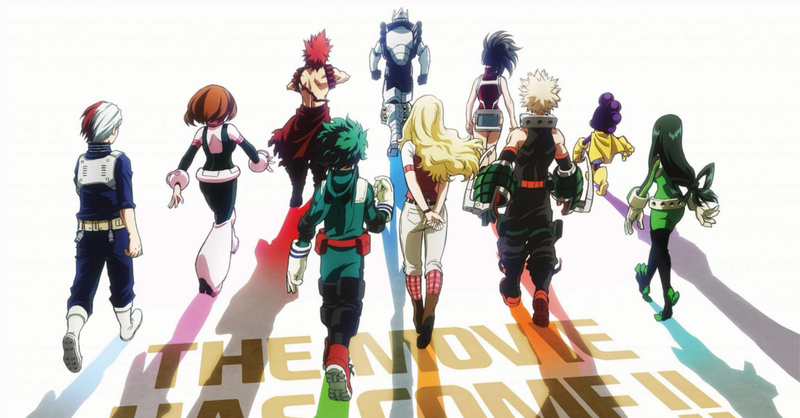 As for Class 1-A, not all 20 students were part of the movie’s main storyline, but fan favorites such as Ochaco, Bakugo, Momo, and others were thankfully present. Their role in the movie might not be as big as Deku’s or All Might’s, but their presence is very much welcome. While I’ve waxed poetic so far about the film’s story and characters, it’s not exactly a perfect film on those regards. Firstly, the movie’s main villain Wolfram was rather weak. Not weak in that he presented no threat to the heroes, but rather because his lack of strong motivation made him fairly one-dimensional. He also paled in comparison to BNHA’s other villains such as the creepy Shigaraki or the menacing All For One. Aside from Wolfram, the film also lacked just a tiny bit in the story department. While I did say that the story was exciting and engaging, it doesn’t really take too many risks. What happens in the movie is also fairly predictable, especially if you’ve watched all three season of BNHA. Don’t be turned off by the film’s villain and fairly by-the-numbers story though; these two are nitpicks really, especially when you take into consideration the movie’s animation. The BNHA series is well-known (and loved) for its exciting action sequences, and Two Heroes serves up even more hype fight scenes! The film’s action ramps up during the second act, and boy is it a treat for BNHA fans! It’s always great to see the students of Class 1-A fighting off villains, especially in the big screen. If the first few skirmishes in the movie were great, then the climatic battle was even more awesome. Sure it might not have the weight of some battles in the series, but it more than makes up for it in sheer scale. The final fight between the heroes and the villains of the movie is a sight to behold in the big screen! Aside from heart-pounding action, the movie’s voice acting and soundtrack are also great. The BNHA voice cast knocked it out of the park once again in this movie! 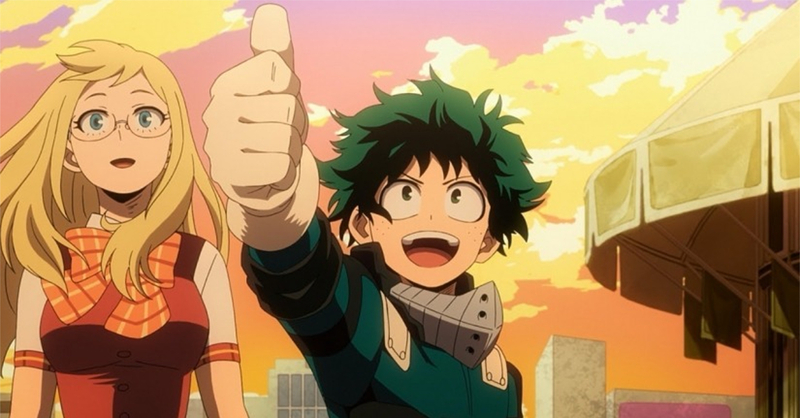 As for the soundtrack, there may not be much in the way of memorable new music but it did use the anime series’ existing score well, espeically All Might’s main theme. Overall, My Hero Academia: Two Heroes is a must-watch for any BNHA fan, especially in cinemas. The film may not have the best villain nor a groundbreaking story, but it more than makes up for it with great characters and amazing action. If I were to describe the movie, it’s like watching an episode of My Hero Academia but longer and with bigger fight scenes! If you aren’t a My Hero Academia fan, I’d still recommend giving this movie a watch given that you can understand it without prior series knowledge. But if you’re a BNHA fan who has yet to watch the movie, go watch it now! My Hero Academia: Two Heroes is still showing in select cinemas nationwide! 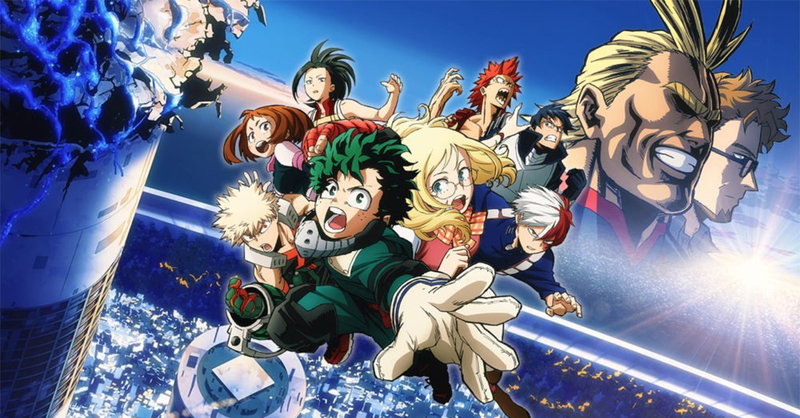 While it has a rather weak villain and is far from a groundbreaking movie, My Hero Academia: Two Heroes is a must-watch for BNHA fans thanks to exciting action, great characters, and excellent animation. The movie is basically like a feature-length episode of the BNHA anime! Previous articleHuawei Mate 20 Series sells like hotcakes in the Philippines! Next article[BlizzCon 2018] Warcraft III: Reforged Team Promises Exciting Plans for Remaster! Case Reopened! Nendoroid Detective Conan Available for Pre-Orders!